Documentation: Specimen: HMM 2649, 14 Jul 1916 Hildreth, Franklin Co.
Taxonomy: Both Gill and Donsker (2017) and Pyle (2008) consider the species monotypic; three subspecies have previously been recognized, including atratus of southern North America (Clements et al 2016). The Nebraska records are presumed atratus if subspecies are recognized. The history of this species in Nebraska is poorly documented. There is a specimen at Hastings Municipal Museum (HMM 2649) collected 14 Jul 1916 in Franklin Co, and seven other reports and specimens with no or poor documentation, all pre-1963. There is no pattern to the dates of these old records. 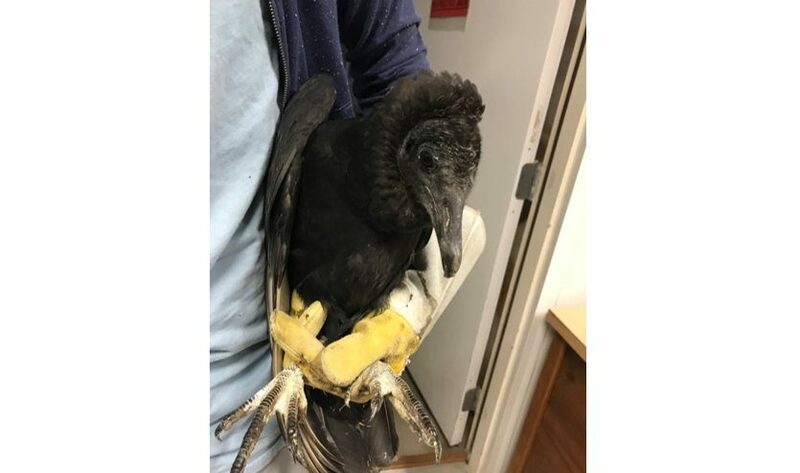 A noteworthy event was the capture of an exhausted but uninjured immature Black Vulture in a Lincoln, Lancaster Co yard 23 Sep 2017; it was transferred to Raptor Recovery at Elmwood, and, after a stay, released in Oklahoma 23 Nov (Betsy Finch, pers. comm.). It appeared at the same time as a Magnificent Frigatebird, so likely an exhausted hurricane/tropical storm-driven bird. It is perhaps more than coincidental that the 1916 specimen cited above preceded a major hurricane that struck Texas a month later in Aug 1916; it seems possible the occurrence of this 1916 bird was in some way related to this hurricane. Bray et al (1986) accepted a minimal description of three seen near Hordville, Hamilton Co 15 Mar 1963 (Gates 1964), but the date of the sighting is rather early relative to the few confirmed sightings from neighboring states and is probably best considered unconfirmed (see Comments). There are about six additional reports, most without details. One was collected by Talbot at Wolf Creek, Pawnee Co, before 1904 and placed in the University of Iowa collection (Bruner et al 1904), but none of the Black Vulture specimens now there collected by Talbot are labelled (Bray et al 1986). Brooking (Notes) mentions one taken by a boy near Kearney Oct 1918, mounted by Black, and now in the Olson collection at UNK; this specimen could not be located, although a specimen was described by Swenk (Letter dated 11 Oct 1918, NOU Archives) as collected by Black “on the 18th of last month,” thus 18 Sep 1918; a photograph was sent to Swenk with an offer to purchase the specimen, and it appeared to be “nicely mounted and in good plumage.” It seems likely that this is the specimen supposedly in the Olson collection discussed above. Additional reports, with few or no details, are Jan 1950 Keith Co (Johnsgard 1997), 7 Apr 1926 Sioux Co (Swenk 1927), 27 Apr 1955 Keya Paha Co, and Apr 1951 Logan Co (Johnsgard 1997). Comments: The annual hawk watch at the Hitchcock Nature Center, only a few miles across the Missouri River in Iowa, has reported this species twice: one was seen 22 Sep 2002 and another on 20 Aug 2005, and there have been an additional five records in Iowa since 2005, with no seasonal pattern (IOU 2018). The regular range reaches into extreme southeast Kansas, where sightings are increasing (Thompson et al 2011), but there are very few records north and west of there on the Great Plains, three in Colorado, all Jul-Aug (CBRC 2018) and none in South Dakota (Tallman et al 2002; eBird.org, accessed December 2017). Photograph (top) of Black Vulture recovered in Lincoln, Lancaster Co 23 Sep 2017 by Douglas Montgomery and is provided as a courtesy by Fontenelle Forest’s Raptor Recovery. Colorado Bird Records Committee [CBRC]. 2018. Black Vulture records. Colorado Bird Records Committee database, accessed 23 May 2018. Iowa Ornithologists’ Union. 2018. Black Vulture records. Iowa Records Committee reports of Iowa rare bird records, accessed 30 April 2018. Swenk, M.H. 1927. Letters of Information 23: 8.